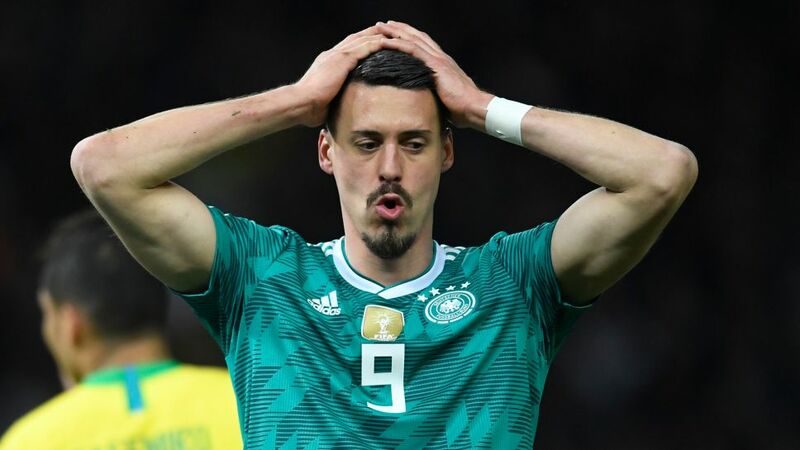 Bayern Munich have rallied around Sandro Wagner after the striker was omitted from Germany's provisional 2018 FIFA World Cup squad. Pictures from Bayern's training ground on Tuesday showed Wagner in tears while being consoled by teammates such as Robert Lewandowski. Bild reported that the squad gave the crestfallen 30-year-old a round of applause, and that Bayern manager Jupp Heynckes addressed the issue with the group. The German daily newspaper claims that the veteran manager said that he could not understand the decision, and would have selected Wagner had he been Germany coach. Speaking after announcing his preliminary squad earlier on Tuesday, Germany boss Joachim Löw said that it was a tough call to select Freiburg front man Nils Petersen ahead of Wagner, but one that did not reflect badly on the Bayern player. "My job as national manager is unfortunately also to shatter dreams and make hard decisions," the 58-year-old said. "It is never against a player, but always in the interests of the team." Wagner earned his first cap for the world champions in June 2017, and went on to score five goals in three World Cup qualifiers – including strikes in victories over Northern Ireland and Azerbaijan last October. He moved from Hoffenheim to Bayern in January, and netted eight goals in 14 league matches as the Bavarians claimed their sixth successive Bundesliga title. The uncapped Petersen scored 15 goals in 32 league matches this season, helping save his club from relegation and making him the top-scoring German forward in the Bundesliga in 2017/18. Petersen's only senior international experience was as part of the Germany team that won silver at the 2016 Rio Olympics, but Löw cited the Freiburg forward's excellent goalscoring record as a substitute as being one of the reasons why he had included him instead of Wagner. Löw, who has signed a new contract to take him through to the 2022 World Cup, revealed that he had called all the key players who did not make the squad. "Sandro showed his class when he was with us," he said of Wagner. "He played for us with full commitment and he has a very, very good character. In the end, minor factors were decisive." Wagner was not the only big-name player to miss out. Mario Götze – who scored the winning goal in the 2014 World Cup final – was also overlooked by Löw. "Mario has superb qualities, and has shown them with us before," Löw said of the Borussia Dortmund midfielder. “"But this season he wasn't in the form [that he needed to be in]. I hope that after the summer break he can have a positive, fresh start at Dortmund. "I feel for him because I know what he has produced in the last few years."